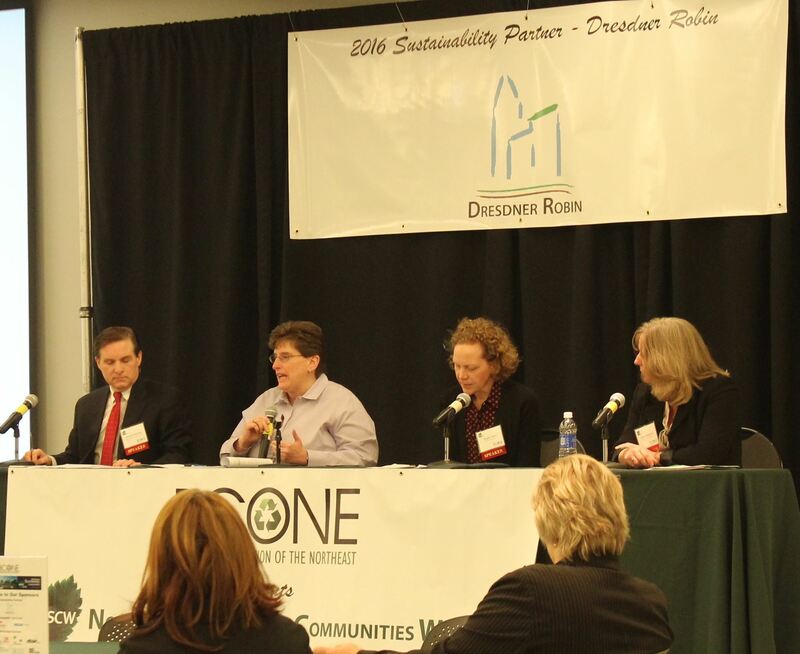 The 7th annual Northeast Sustainable Communities Workshop, under the direction of BCONE Executive Director, Sue Boyle, was a great mix of networking, information sharing and exploration. It brought people from government agencies, professional services, municipalities, non-profit organizations and invited everyone to question, share and report on how we could help unlock the opportunity of brownfield development in sustainable and equitable ways. 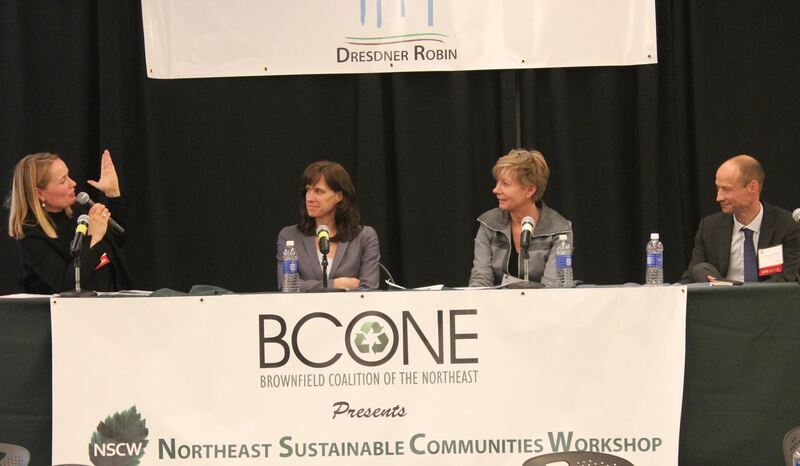 Sue Boyle, Executive Director of BCONE kicked off the conference welcoming the audience of over 150 practitioners to the 7th annual Northeast Sustainable Communities Workshop. She encouraged participants to actively engage in each session’s discussion, take the opportunity to network and visit the exhibitor booths. And we did. The Morning Plenary session shone a spotlight on the delicate balance of the needs of commerce, eco-system preservation and waterfront development along the New Jersey/New York shoreline. Panelists, Debbie Mans, Executive Director of NY/NJ Baykeeper, Colette Santasieri, Director, of Policy and Planning Innovation at the New Jersey Innovation Institute, and Bethann Rooney, Assistant Director, Port Authority of New York and New Jersey expertly described their respective work and set in sharp relief the interlocking dependencies, the potential for escalating conflict and the high stakes need to find a sustainable balance between a world class seaport, redeveloping waterfronts and ecological preservation. The Port Authority of NY/NJ oversees the third largest port in the United States, processing over 6.6 million containers a year of imported products. It is a good bet that almost any imported product we buy disembarked at the Port Authority facilities. To increase the efficiency as an import hub, the PA is raising the Bayonne Bridge to allow larger ships to enter the waterways and increasing the rail network to facilitate moving containers from ship to rail within 24-36 hours. With nearly 300,000 employees, they are a significant direct and indirect contributor to the local and regional economy. The movement of this volume of goods has an impact on our roads, air quality, and water eco-systems. The Port Authority’s Office of the Environment is leading the agency’s efforts to mitigate the environmental impact from their operations. This includes its voluntary Clean Air Strategy which focuses on truck emissions as well as eco systems, energy consumption, protecting species, and reducing greenhouse gases. Pollution from commerce and development has degraded natural habitats and animal and water life. Debbie Mans from NY/NJ Baykeeper highlighted her agencies efforts since 1989 to restore the harbor’s estuary and breathe new life into the ecosystem. Colette Santasieri from NJII highlighted the third dimension; the drive to redevelop the waterfront properties. There are many abandoned industrial properties along the water front that could be converted into new residential properties, commercial spaces and amenities to attract to tourists, adding new life to the local area and tax revenue to local municipalities. Lack of jurisdictional control. There are a myriad of waterfronts and water ways. Jurisdictional control splits across the country, municipal, state and federal governments as well as quai governmental agencies like the Army Corp of Engineers. This means no one agency has the authority to adjudicate issues that cross multiple territories. Lack of a regional plan or vision. There is no regional agency or group that is charged with developing a multi-layered plan for the region with private, public and community input and support. Conflicting priorities. The Port drives our economy, but the resulting noise, emissions, and road congestion impact both the local eco-systems and attractiveness of brownfield development opportunities. The complexity of the issues and the tenuousness of the relationships. The panelists agreed that there has been insufficient transparency, communication and engagement of the local community. This is compounded by normal turnover in key positions. With so much at stake, it is crucial we invest in winning solutions and drive dialogue, engagement and trust to realize a shared vision, shared gains and shared goals for NY and NJ’s waterways. 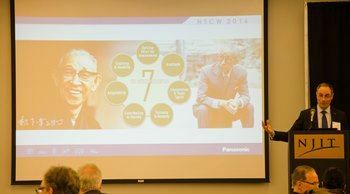 Panasonic Chief Financial Officer, Mike Riccio was the 7th annual Northeast Sustainable Communities conference keynote speaker. He had hoped to walk to the NJIT building where the conference was held from Panasonic’s new LEED-certified Newark office. Running late, he drove a company hybrid, diesel vehicle. He has given up his own car, joining over 57% of Panasonic employees who use public transportation to get to work. Panasonic gets this exceptional level of buy-in by making the end goal easy and cost-effective: they help people come up with the best routes and subsidize public transit by up to 50% of the cost. Sustainability is a driving force at Panasonic. From sustainable electronics product design to cutting edge battery and solar panel products, Panasonic is striving to be the leader in green electronics by 2018. This coincides with the company’s 100th anniversary. Japan’s unique history of earthquakes and natural disasters coupled with nominal energy resources, shapes the company’s approach to sustainability, alternative energy and minimizing its environmental impact. Interesting new forays include Panasonic’s launch of Smart City Denver, which will incorporate cutting-edge solar energy use, in-home tele-medicine technology and video for traffic management and security and their investment in Tesla’s battery production gigafactory in Nevada. Look no further than Panasonic’s Sustainability Reports to learn about how they are reducing greenhouse gases, lowering energy and water consumption and reusing products. There are lots of ideas there for practices you could incorporate into your company’s operations to reduce your environmental impact. And don’t forget to recycle your electronics. The Afternoon Plenary session kicked off with the question, “What kind of City do we want to create?” This question may have fallen flat several years ago, but the recent COP21 Paris climate talks have succeeded in shifting many cities into high gear around climate change and adaptation. Hoboken, NJ and Copenhagen, nearly 4,000 miles apart, are both struggling to stop intrusion of coastal and rain waters (“cloudburst”) from flooding their cities. Dramatic pictures of cars covered by water and storm surges made clear that these real-time natural disasters require leadership and vision to address the recurring crisis. Speakers Mette SØs Lassesen, Market Director, Synergies and Livable Cities for Ramboll Environ (Copenhagen), Dawn Zimmer, Mayor of Hoboken, NJ, Pernille Andersen, Managing Technical & Environmental Director for the City of Copenhagen and Christian Nielsen, Head of Department and Global Services for Ramboll Environ (Copenhagen) provided an inspiring mix of vision and practicality in their approach to adapting their cities to climate change. Copenhagen’s vision is solidly grounded in a long-term approach, backed by a $16 billion investment over the next 30 years in flood-control measures. These adaptation measures are rooted in community-led initiatives and include above and below ground integrated solutions to manage flood water, pubic amenities, and open spaces. Political courage and clear priorities are at the cornerstone of Copenhagen’s well-deserved reputation as a “liveable” city. Mayor Zimmer of Hoboken spoke about the $230 million Rebuild by Design grant awarded to Hoboken to address flooding due to low lying areas, storm surge and a rise in sea levels. They are designing and implementing a water management strategy that centers on all the ways that water can be resisted, captured and delayed from going down into sewer system. This translates into new pumping stations, rain gardens, cisterns, green roofs, porous pavements, new parks, and coastal defense. The two cities were united in their advocacy for city-driven solutions with strong civic engagement. The unifying message: more can be done when we work in collaboration and engage citizens. Both use social media, town hall meetings and other methods of engagement to educate, get input, allay fears and prioritize public amenities. When asked if we wanted to visit Copenhagen, we all raised our hands.